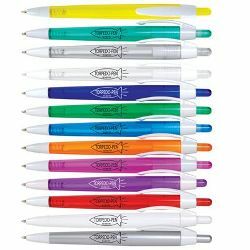 Affordable writing instrument in a wide selection of transparent colours. Push button with White clip. ITEM SIZE(MM) 134L x 11Diameter. PRINT AREA(MM) Barrel Roll Print - 35L x 25H, Barrel Pad Print - 40L x 7H, Digital Print - 40L x 7H. COLOURS Yellow, Orange, Red, Pink, Dark Green, Light Green, Dark Blue, Light Blue, Purple, Silver, Clear, Charcoal, White.